Posted on October 17, 2017 at 7:00 am. The Solar Training Center at Haiti Tec in Port au Prince, Haiti, will have an EG145 solar street light on hand when the inaugural first-year solar technician class starts up in late October 2017. Brad Burkhartzmeyer and Carol Weis, members of the Solar Electric Light Fund (SELF) curriculum team, set up a solar technical laboratory at Haiti Tec for the training center, where the program will be held. Sol is committed to dedicating a portion of profits to advance solar lighting in areas that need it most, yet may not have the means to acquire it. SELF was a perfect fit for our funding, as a world-leading NGO in designing and implementing solar energy solutions for areas without access to the grid. 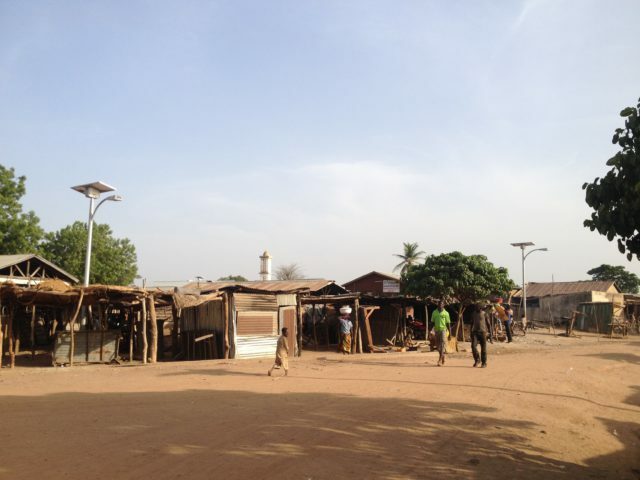 Solar street lights installed in Dunkassa, Benin. Stay tuned for updates on this project once the program gets underway. >> In addition to supporting solar lighting training and education in regions experiencing energy poverty, we also support training closer to home. Are you a contractor who wants to install solar outdoor lighting in your area? Sign up to become a Sol Certified Contractor now.